DUCOIA documents are available by contacting the Wolfe Pointe Property Owners Treasurer, Tom Foster at tomlfoster@comcast.net. The cost of obtaining these documents is $200. 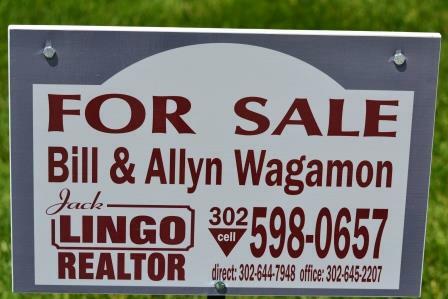 Because no advertising is allowed in Wolfe Pointe, all realtor signs must be of a standard design. The standard sign must be no larger than 18”x24” with gray perimeter background and white center with maroon letters. The following is a picture of a conforming sign. If you are interested in buying a home or a lot in Wolfe Pointe, please check our real estate update. You may also want to take the Community Virtual Tour. Delaware is also one of the most tax friendly states in America. Kiplingers.com rates Delaware as the sixth most tax friendly state. Click Here for more detailed information. If you are buying a home or lot in Wolfe Pointe, we'd like to extend a warm welcome! Before settling on your property, may we suggest you (or your Real Estate Agent or Attorney) contact the Homeowners' Association to ensure that there are no outstanding issues with the property, unpaid dues, or other items that may be of concern once the property is purchased. If you are selling your home in Wolfe Pointe, first we'd like to say "We're sorry to see you go!" Make sure that if you are selling, you check our Covenants and Restrictions. There are items in there that deal specifically with sales of property. The full document can be found on the Public Documents page.